With the seasons changing, and Christmas and Valentine's Day behind us, it's time to start looking forward to creating a little bit of Easter decor. And what better way to do that than with the gorgeous products readily available through Jillibean Soup. I've been wanting to create a festive banner for some time now and to combine it with the gorgeous, soft colors of Spring. This banner is very simple and takes less than an afternoon to put it together. Start this project by gathering your supplies; including a template for an Easter Bunny and a heart for either a die cutting machine or free hand design. Many of these templates can be found online for free. I've created several different sizes for the bunnies as well as having them face different directions. After creating a heart stencil that fits onto the burlap banner, select a paint color from the Happy Hues collection and apply it directly. Ensure the stencil stays in one place by holding it firmly with your free hand when applying paint with your other. I have alternated the colors of the hearts over five banner triangles. Allow sufficient drying time between colors if you are using only one stencil. Lay two pieces of florist wire onto a flat surface and arrange the Alpha Tiles and bunny cut outs until you are happy with your design. Leave approximately 1" of florist wire at each end of the bottom wire, to allow the word embellishment to be attached to the banner. Be sure to overlap and layer elements to create a more dimensional look. 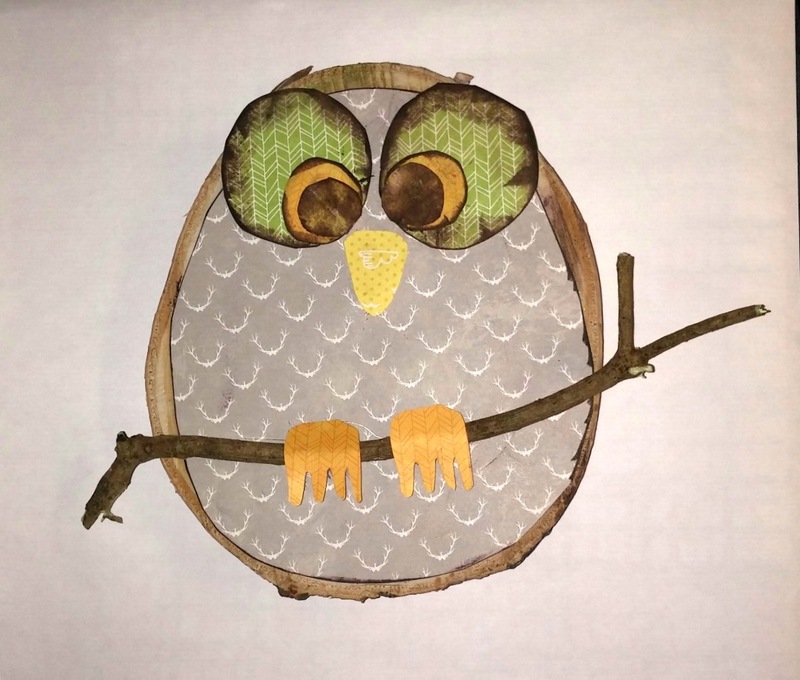 Once happy with the layout, carefully use a hot glue gun to adhere the paper to the wire. Once the word embellishment is secure, carefully thread through the top of the burlap banner edge and bend the excess wire behind to help secure it in place. Patterned Paper: Summer Red Raspberry Soup/whipped cream; Chilled Cucumber Soup/sherry vinegar; Happy Camper Stew/2 parts adventure. Other - florist wire, Easter Bunny & heart silhouette cut file/template. 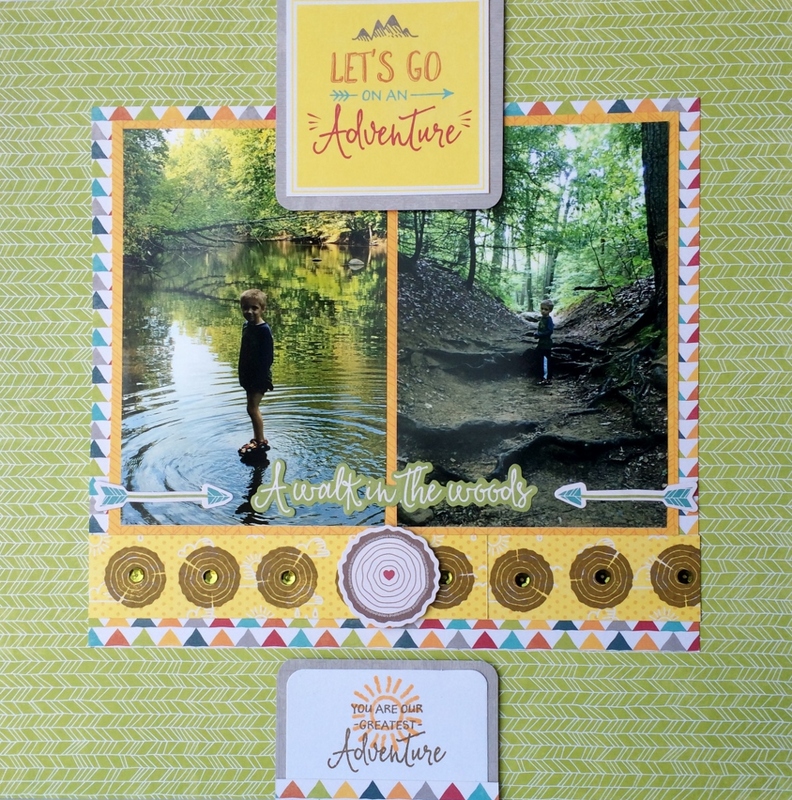 I knew from the first moment I laid eyes on this collection that it would be perfect for all our camping photos and Cub Scout events (watch the Jillibean blog this month for a double layout of my son’s Bobcat Ceremony in Cub Scouts). So I grabbed two of my fav camping photos and got to work. 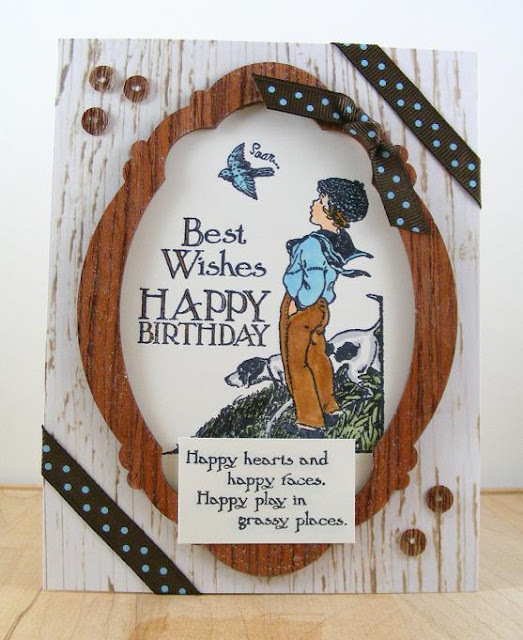 The stamping started with the wood slices border strip in brown ink onto the sunshine paper. 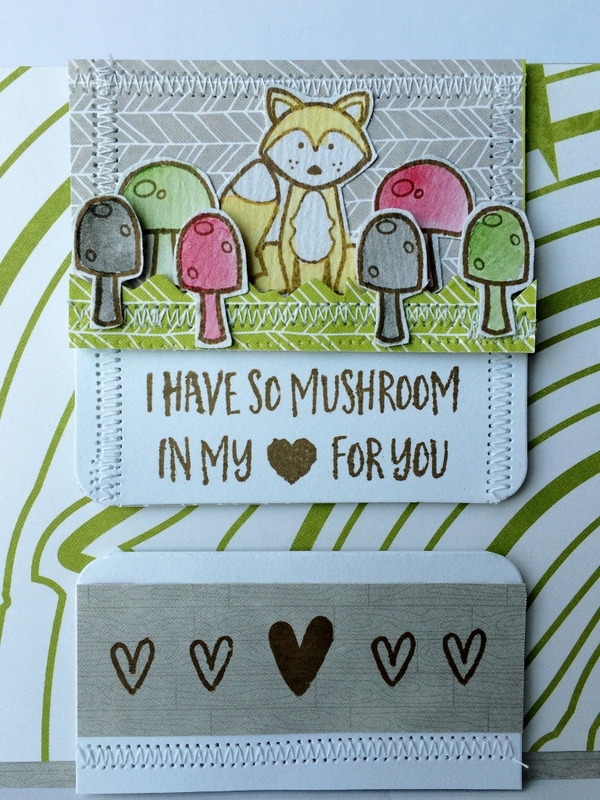 The sentiment above is my favorite of the new Mushroom Medley stamp set, so perfect for a layout or a card. So grab your camera and capture some outdoor pics and give this collection a try, I think you’re going to like it. Other: white cardstock, white and gold mist. 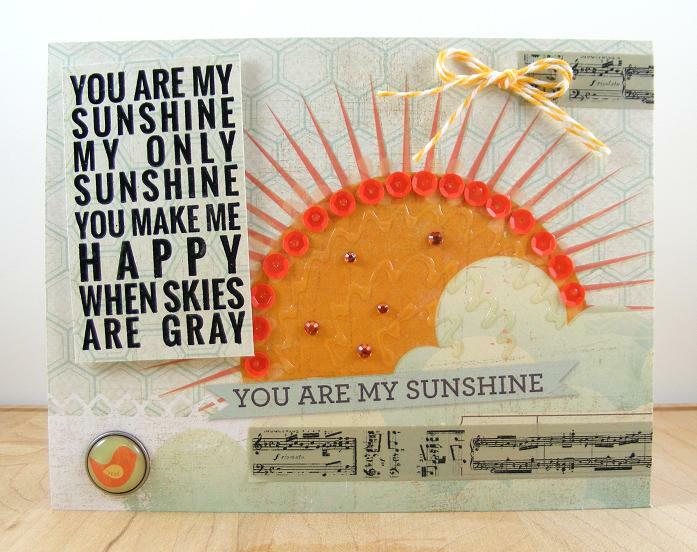 Today's card features Jillibean Soup's Sew Sweet Sunshine Soup papers and the oh-so-cool Denim Alphabet Tiles! 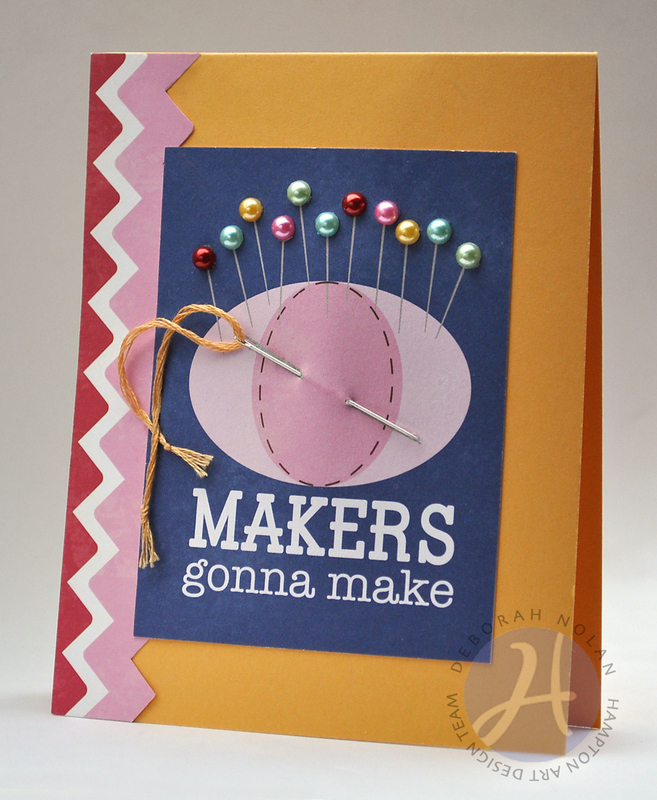 Make card base for a 4.25” x 5.5” card from kraft. Cut and adhere 4.25” x 5.5” panel of Sew Happy PP. Cut panels from marigold cardstock and adhere to alphabet tiles. Adhere alphabet tiles to card with foam dimensional tape. 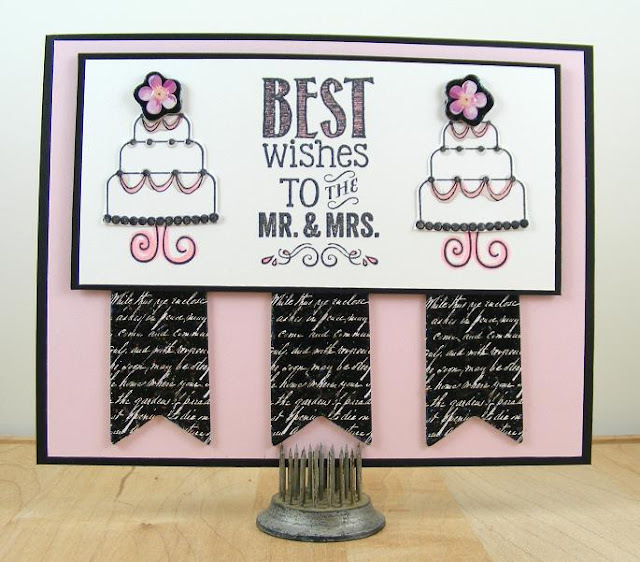 Die cut flower and leaf and adhere to card with foam dimensional tape. Die cut circle from scrap PP and adhere to flower center. Thread button with twine, tie into bow and adhere to flower center. 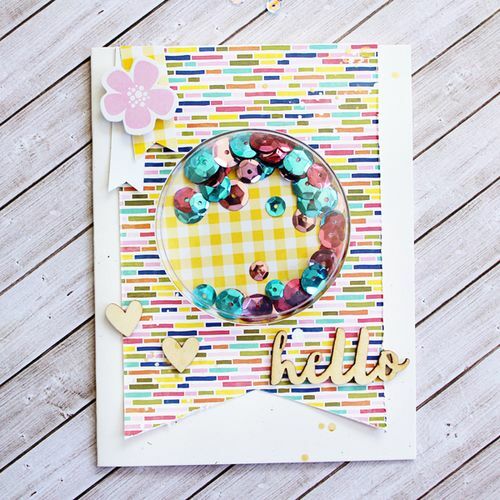 Today I have a fun and fast way Easter card set for you using the Jillibean Soup Shape Shakers and some of the Healthy Hello collection that starts shipping soon! I started with our large circle Shape Shaker die-cut card bases. I traced around the outside of the card base on a scrap piece of paper and sketched out an egg shape. 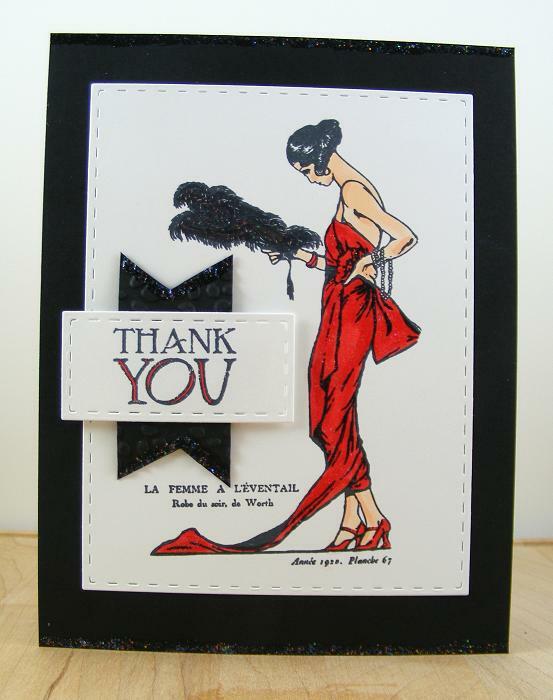 I cut it out to use as a template and to cut down the Shape Shaker die-cut cards. Next I started decorating the shaped card blanks. 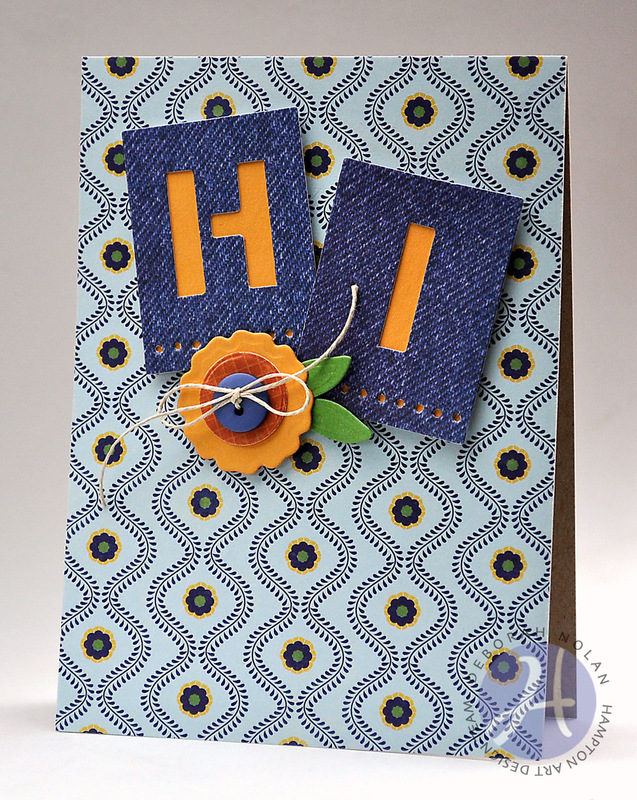 I used strips of the Healthy Hello papers and adhered them to the front of the card. To make it easier to cut out the large circle opening, I used smaller strip pieces so I could easily get in and cut away the excess paper with my scissors. I finished decorating the cards with stamps, die-cuts and stickers from the Healthy Hello collection and the Shape Shakers collection. I love this new stamp set in the Healthy Hello collection. Stamp the flowers and then the centers. 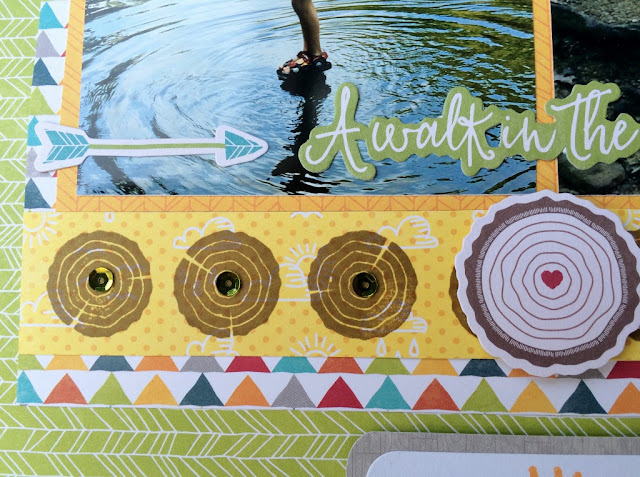 The two-step stamping lets you layer additional colors to each image. 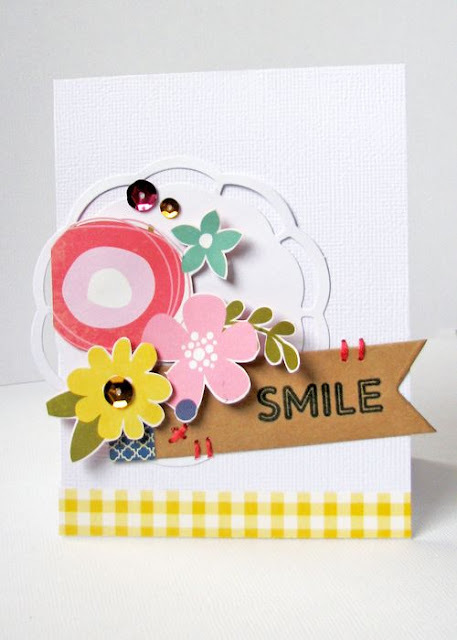 This card uses the Oh Happy Day! stamp set from the Shape Shakers collection. The dotted line is he string for the banners in the birthday stamp set. These really were quick and easy to do. From start to finish, I was able to create them in about 30 minutes. Now to try not to break into them for the candy before Easter! Hope you will try to create these cards! Need a card to cheer someone up this spring? Here is a fun one complete with a bee and dragonfly. 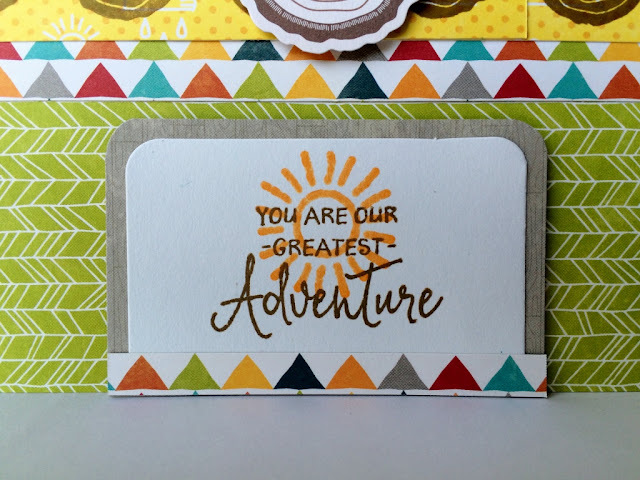 It is a combo of Jillibean Soup Summer Red Raspberry and a brand new stamp set that was released with the new Shape Shaker system. To begin I chose a white card base and layerd the bubbles paper onto it as a background. Then I pulled out the “Noted:” mini placemat and stamped the sentiment in brown ink. After that I layered it onto the floral paper using it as a mat. I did add a separate backer, Red Wine paper, behind the “Noted:” cut out for effect. Then I fussy cut a rose from the large floral paper of that same collection and grabbed a pea pod flower as well. The flowers were then adhered to the mini placemat as shown. 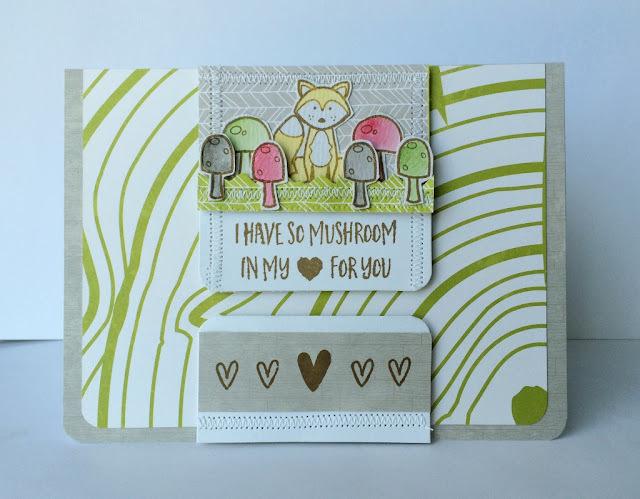 The stamps were then stamped in brown ink onto the diaganol stripe paper and fussy cut out. 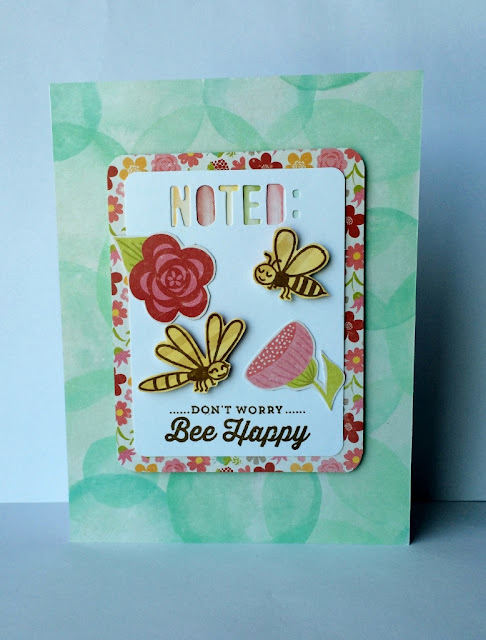 I added the bee and dragonfly to the card front as shown with 3D pop up dots. It was that easy and pretty quick too, so no excuses! Share some springtime encouragement with someone you care about today! 1. Trace wood slab onto the back side of the JB1042, trim appros. ¼ to ½ inch inside the traced line. 5. From JB1043, cut two – ¾ “ circles (use the yellow side) and cut 1 triangle 1"-1 ½" (will be used for the beak), Ink around the orange and green circles with dark brown ink. 6. Apply ink to the yellow circle. 9. Arrange the eyes on the slab and glue in place. 11. Use strong glue such as E6000 to adhere the limb to the slab. 12. Use a drop of the same glue to adhere the feet. Very cute on a shelf but will be a great addition to a grapevine or evergreen wreath. Today I wanted to share a dressed up gift bag using the brand new Jillibean Soup/Healthy Hello collection. I made this one for my daughter’s birthday and thought it was worth sharing. I grabbed the lovely large floral paper to start with and made it into the banner shape. Then I stamped in brown ink directly onto that paper the “You are My Happy” sentiment at bottom of banner as shown. Next I stamped the flower base layer onto watercolor paper in pink and brown outline as shown. 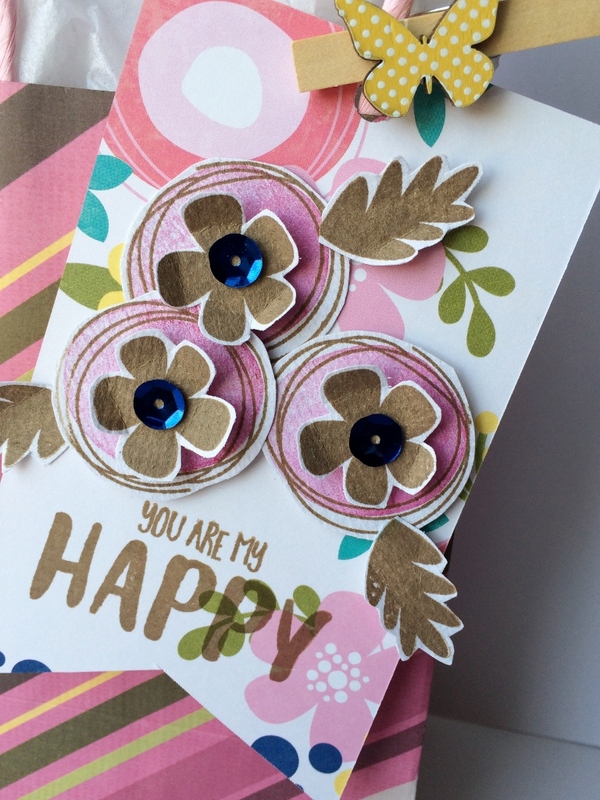 Then I stamped the brown flower centers and leaves and fussy cut out all of the flower pieces. I proceeded to build the layers of flowers adding the flower centers with 3D pop up dots as shown adhering to the banner base. Next I added some new dark blue adhesive sequins to the centers of the flowers for some bling. 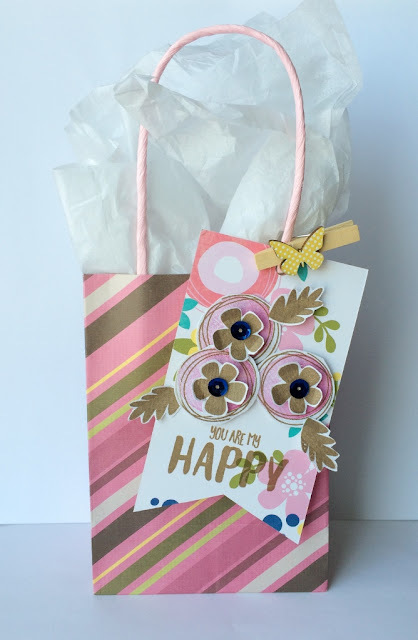 To add it to the gift bag I used a large hole punch and punched in the top center of the banner base. Then cut a notch to the hole and slid onto bag handle. To dress it up a bit more I grabbed one of the brand new butterfly clothespins in yellow and clipped it on as shown. The result is a cheerful bag sure to make anyone happy, my daughter included. Today's card features some goodies from Jillibean Soup's Sew Sweet Sunshine Soup collection and... a needle and thread! Cut and adhere strip of Sew Creative PP along left side. Thread needle and knot both ends of floss. Adhere panel to card and then spot-adhere floss to panel. Adhere pearls to tops of stickpins. 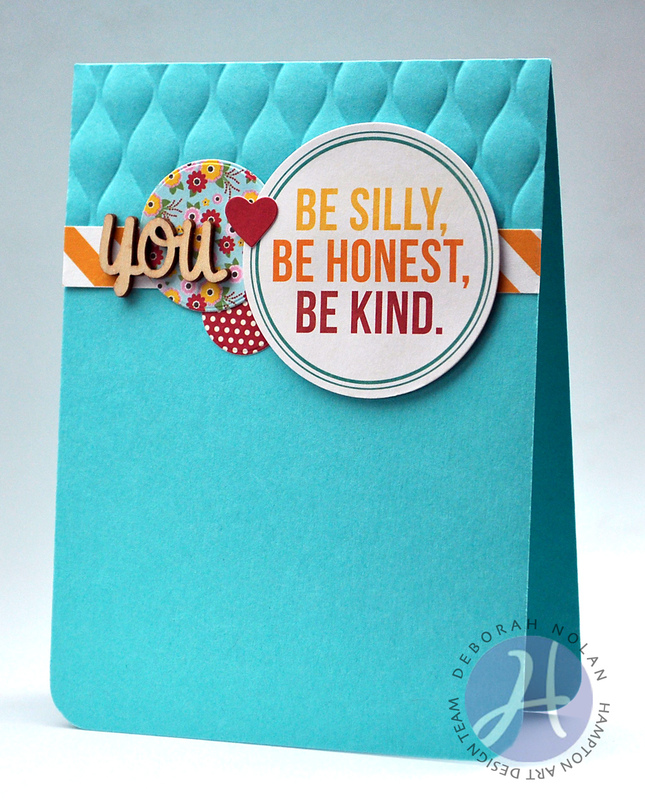 Make a 4.25” x 5.5” base from cardstock and round bottom corners. Emboss top 1.5" with folder. Cut and adhere strip of scrap PP. Die cut and adhere circles from Sew Fun PP. Adhere sentiment Alphabet Soup II Pea Pod Part with dimensional foam adhesive. Adhere heart Fur Fusion Pea Pod Part. Adhere Saffron Yellow Pepper Soup Wood Veneer "you." 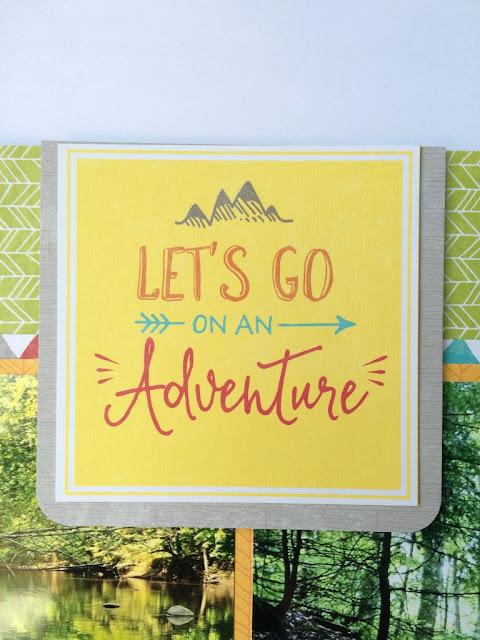 Chipboard Stickers -- Michael's Stores, Inc.
Glitter Finish -- Mod Podge Extreme Glitter by Plaid Enterprises, Inc.
Glaze -- Mod Podge Dimensional Magic in clear by Plaid Enterprises, Inc.